Teenagers often feel stress due to academic, family or social pressures, and the Teens Health website encourages parents to watch for signs of more serious, stress-related concerns. 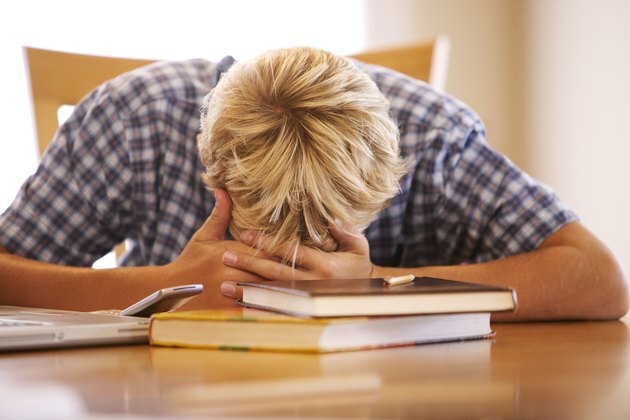 Find ways to reduce the factors that are worrying your teen and look for symptoms of “stress overload,” says Teen Health, such as physical ailments, changes in sleeping patterns, panic attacks or depression. Teenagers often feel stressed about academic and extracurricular demands, according to the American Academy of Child and Adolescent Psychiatry. Students feel pressure to complete daily classwork and homework assignments, finish projects and study for exams. In addition to the quest for good grades, teens may also participate in extracurricular activities, such as sports, student council, cheerleading and clubs. The added pastimes may contribute to teenage stress and anxiety if the activities are competitive and require scheduling that cuts into study and relaxation time. Be mindful of your teen's academic and recreational obligations to ensure she's not taking on too many responsibilities. The American Academy of Pediatrics considers peer pressure a teenage stress factor. Although your teen may have a solid group of friends, her peers may pressure her to hang out in lieu of studying, break ties with former friends that the core group doesn’t consider “cool” or experiment with drugs, alcohol or sexual activities that go against her morals or family rules. Peer pressure, bullying on campus and harrassment through phone calls, text messages and email may distract your teen from studying, leading her to feel additional stress and anxiety. Teenagers can also feel stress at home because of family pressures and problems. If you have recently gone through a divorce, experienced economic hardship that affected your teen's quality of life or found new living arrangements that reduce her privacy, consider how this may impact your teen's stress levels. Arguments with siblings, disagreements with parents over rules and expectations and the need to consistently care for younger siblings may also contribute to teen stress. Teens may also feel stress and anxiety when experiencing a sense of loss. In addition to dealing with the health problems or the death of a friend or family member, “loss” can mean the end of a relationship, friendship or cherished extracurricular activity. Breaking up with a boyfriend or best friend, for example, may lead your daughter to doubt her self-worth or feel anxious about attending school or social functions because of her change in social status. If your teen has experienced a loss, speak with her about her experience and offer to minimize her stress by providing a listening ear and giving her extra attention. As teenagers attempt to navigate through the school social hierarchy, they may feel self-doubt if they don’t achieve a certain level of popularity. Although your teen may express a sense of despair about her appearance, lack of dates or social status, the Help Guide website recommends watching for signs of extreme self-worthlessness that may indicate depression. Seek help from a mental health professional if you notice prolonged sadness, a withdrawal from family, friends and favorite activities, lack of energy and motivation or mentions of suicide or death.